Throughout its history a multitude of Danish and international circus troupes have played in the Circus Building. On the international front these include Renz, Busch, Wulff, Beketow Cinicelli, while Circus Schumann, Circus Miehe and Circus Benneweis have been the major Danish circus dynasties to perform in the building. In 1982 the City of Copenhagen began a comprehensive and thorough renovation of the Circus Building with the objective of restoring it to its original appearance. 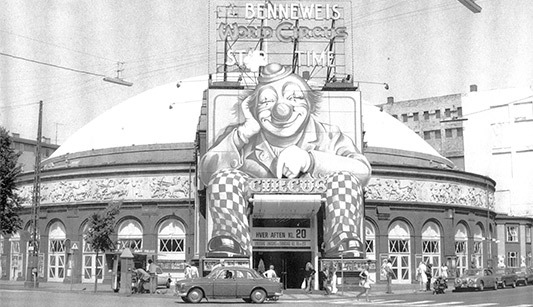 That led to highlighting the distinctive architecture of the Circus Building with the enormous dome, the arched corridors, the festive lobby, the coloured seating and the special circus atmosphere. Meanwhile, everything was given a highly successful, extra touch with the unique colours selected by the architect, Verner Panton. After the restoration both the Circus Building itself and Verner Panton’s colour scheme were listed. This meant that the future of the Circus Building was secured as a significant part of the city’s cultural life. After the renovation, the City of Copenhagen outsourced the management of the building, first to Tivoli (1984-1996) and then to Parken (1997-2002). In 2003 the Swedish entrepreneur Hasse Wallman (born 1936) took over the running of the Circus Building. In 2009 Wallmans became part of the entertainment company Moment Group, who two years later, in 2011, purchased the Circus Building from the City of Copenhagen. So, since 2003 Wallmans have occupied this Copenhagen cultural icon. Today this well-known, popular dinnershow, is the Circus Building’s main activity. Since the beginning of 2003, Wallmans has entertained more than 750,000 guests in the Circus Building. It is not only the people of Copenhagen and Denmark, who make the journey to the Circus Building. Just as the cast of the show comprises creative and professional dancers, singers and circus stars from many different corners of the world, today’s guests also cosmopolitan, representing an enormous cross section of different countries. In contrast to traditional Danish plays and musicals, Wallmans Dinnershow is international. Every guest, regardless of nationality and language, can be bowled over, entertained and thrilled. In addition to Wallmans Dinnershow, today the Circus Building also plays a major role in Danish and international business communities. The Circus Building can accommodate professional and social events, with room for between 200 and 1,000 guests. This makes it an ideal venue for everything from corporate events, award shows and anniversaries to congresses, conferences and meetings.